Plus, control chibi characters in the online mode. 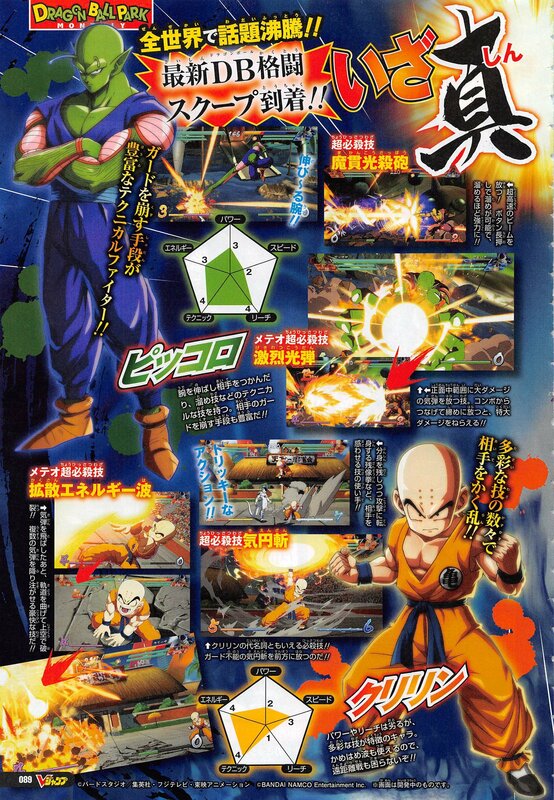 Krillin and Piccolo are playable characters in Dragon Ball FighterZ, the latest issue of V-Jump reveals. Piccolo has technical skills such as extending his arms to grasp his opponent and charge techniques. He has a variety of methods to break the opponent’s guard. He can fire beams at super high speeds. By long-pressing the button, he can charge up for a stronger attack. He also has a technique that fires a Ki blast to deal great damage. When connecting from a combo, it will deal even greater damage. Krillin has low power and reach, but can use a variety of techniques. He can even use Kamehameha, meaning fighting from a distance should not be a problem. He can use skills to confuse the enemy such as the “Afterimage Technique,” which leaves behind an image of Krillin before turning into an attack. He can also use “Destructo Disc,” which is impossible to guard against. After firing Ki blasts, Krillin can alter their trajectory and have them explode in the sky to shoot out multiple Ki blasts. The magazine also reveals that players will be able to control chibi characters in the online lobby, similar to the online system in the Guilty Gear Xrd series, and that those chibi characters will be able to battle against each other in stage matches. Previously announced playable characters include Goku, Vegeta, Gohan, Cell, Frieza, Majin Buu, and Trunks. Dragon Ball FighterZ is due out for PlayStation 4, Xbox One, and PC in early 2018. A closed beta is scheduled for the summer, with registration opening on July 26. Thanks, ShonenGames (2) and Ryokutya2089.